These wellness products help to improve both the body and mind! Being a health and wellness major, I know how important it is to take care of the mind and body. Through my education, I have come to the conclusion that self-care is the number one most important thing to practice in order to be a happy and healthy individual. That said, I am pleased by the fact that Bath & Body Works decided to create an aromatherapy collection. I strongly believe in the use of aromatic plant extracts and essential oils and how these ingredients help to improve one's overall well-being. Here is a list of the fragrances that Bath & Body Works introduced in their wellness collection and how these aromas can significantly affect your mood! "Focus" aromatherapy is made with eucalyptus essential oils, which help to clear your mind, and tea extract, which improves your focus. 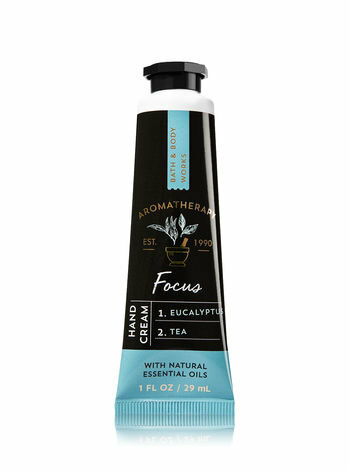 I highly recommend buying the Focus scent in their hand cream. This product is perfect for on-the-go and can be easily stored in your bag! Bath & Body Works hand cream is made with vitamin E and shea butter which helps to strengthen your skin leaving your hands soft to the touch! "Sleep" aromatherapy is composed of lavender and cedarwood essential oils which help to calm your mind. I love this scent in their pillow mist. 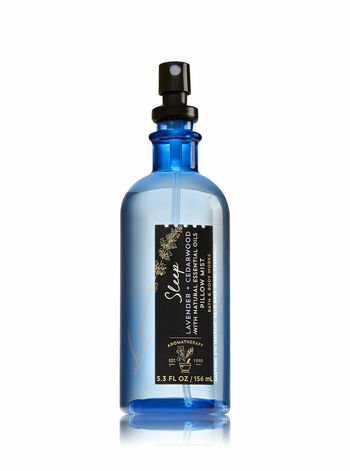 Just lightly spray this mist on your pillow to help calm and clear your mind before a good night's sleep! 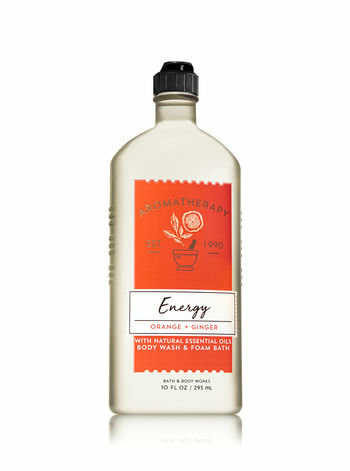 "Energy" aromatherapy is made up of orange and ginger essential oils which help to uplift and energize your mood and spirit. I really like this scent for body wash which is comprised of aloe and bamboo extract. This body wash will soothe your skin after each use! 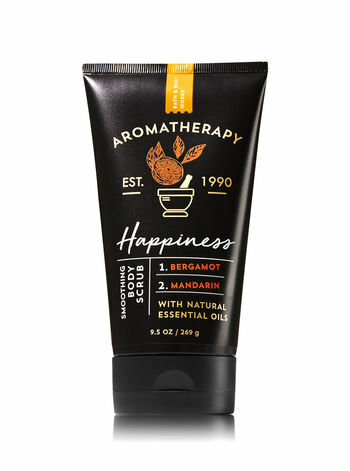 "Happiness" aromatherapy is made with bergamot and mandarin essential oils which are made to enhance your mood and bring a sense of well-being. This scent is great in their gentle Bath & Body Works body scrub. This scrub helps to exfoliate your skin, leaving it feeling super soft! "Stress Relief" aromatherapy is comprised of eucalyptus and spearmint essential oil which combined help to clear one's mind and soothe and uplift someone's spirits. 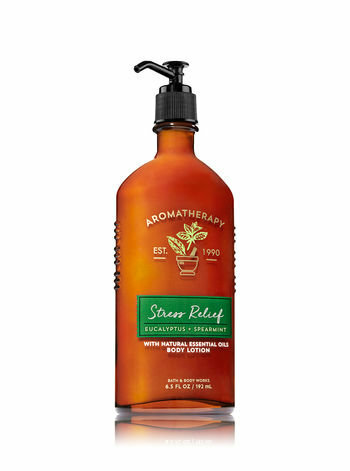 I highly recommend buying the stress relief aromatherapy in the body lotion. The lotion is made with shea butter and includes vitamin E which helps to moisturize your skin with long-lasting effects. This lotion is perfect to use at the end of a long day when you are ready to unwind and relax! 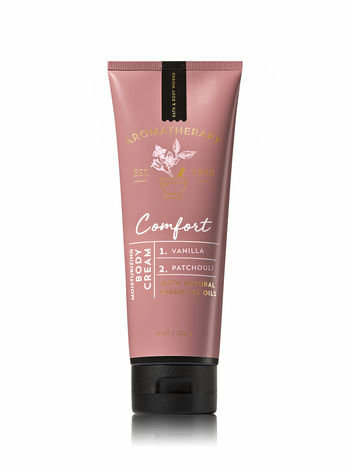 "Comfort" aromatherapy is created with a mix of vanilla and patchouli essential oil. These scents help you to feel comfort and relaxation. This fragrance is great in the form of a body cream which helps to hydrate the skin with its vitamin E and shea butter ingredients. Breathe deeply while applying this body cream to receive best results! "Recharge" aromatherapy is made up of both sage and mint oils. These scents combined help to wake up the mind and body. 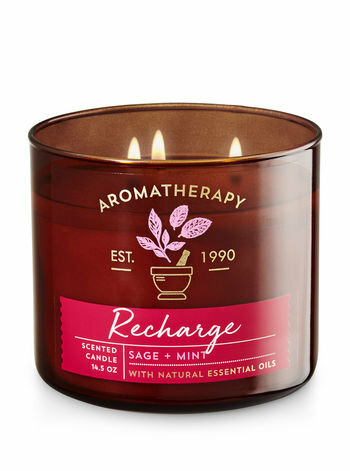 I recommend the recharge scent in the Bath & Body Works 3 wick candle. I love these candles because they burn for about 25-45 hours and leaves the entire room with a wonderful fragrance!